Interested in a Caribbean Cruise? Here's what you need to know. How was the pool and sun decks? How does the restaurant dining work? How does tipping and gratuity work? Have you taken a Caribbean Cruise? How was the experience? In January 2016 we went on a Caribbean cruise with our boys and Nicole’s parents. 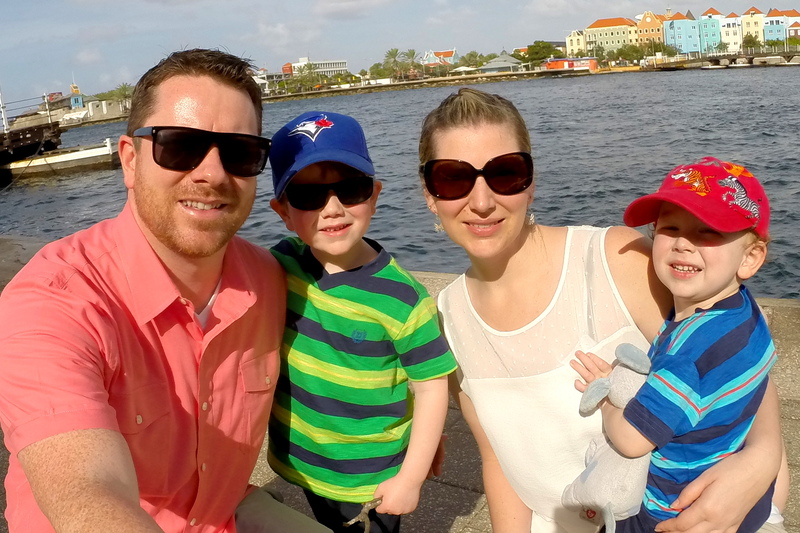 This was our first cruise ship experience as a family, so we had many questions prior to setting sail. 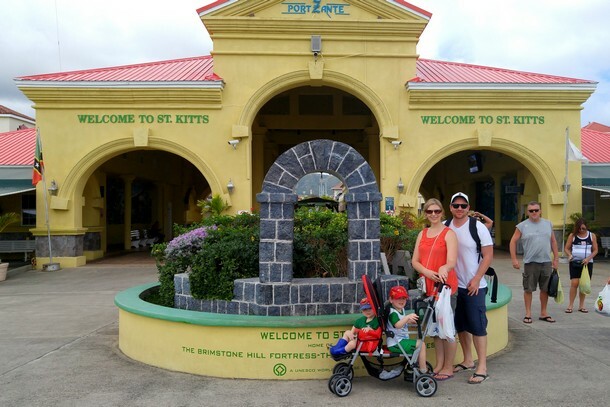 We went on a Caribbean cruise with friends almost 10 years ago, so we had a general idea of what to expect, but traveling with little ones and older ones is a completely different experience. Before we get started, I’d like to share a few interesting stats I found on StatisticBrain.com. According to its website, 25% of passengers travel with their children (under 18) and 37% of all cruises worldwide were taken in the Caribbean. It also states that 1.6 million children (18 and under) sailed with their families. I share this info with you because it captures part of our motivation for choosing a southern Caribbean cruise. As we mentioned in a recent blog post, we like how easy and convenient this form of travel can be, especially with the little ones. We like the idea of being able to see a variety of new destinations in a short period of time without having to pack and unpack every day. Sometimes it’s just nice to turn off the brain. With dozens of ports scattered throughout the Caribbean, and dozens of cruise ship operators, there are plenty of options when it comes to a Southern Caribbean cruise. We chose the Carnival Liberty because it has good reviews and the price for a balcony stateroom was quite reasonable. 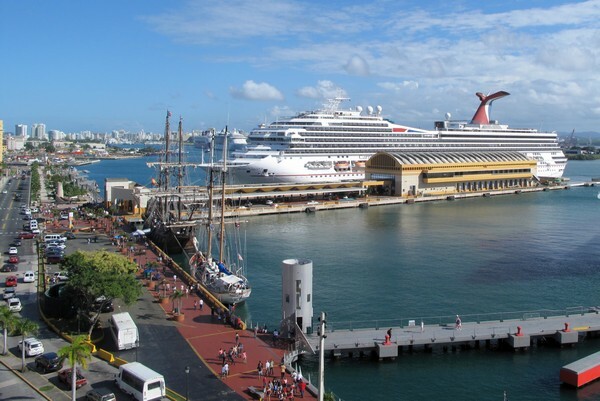 The 7-day cruise we selected visits 6 different ports including San Juan, Puerto Rico, the departure and arrival port. We really like that this cruise itinerary has only one full day at sea, maximizing the amount of time to explore the Caribbean islands. We will go into detail about each port we visited in future blog posts (spoiler alert – we liked the island of St. Lucia best). Some people actually prefer to have more time on the boat and would rather have less ports to visit. We met an older couple in St. Thomas who were on a cruise ship that departed from Baltimore, Maryland. Their cruise spent 3 days at sea on the way down to the Caribbean and 3 more days at sea on the return trip back to Baltimore. They said the demographic on the ship was much older and that they preferred to have the extra time to read books and lounge on the sun deck. 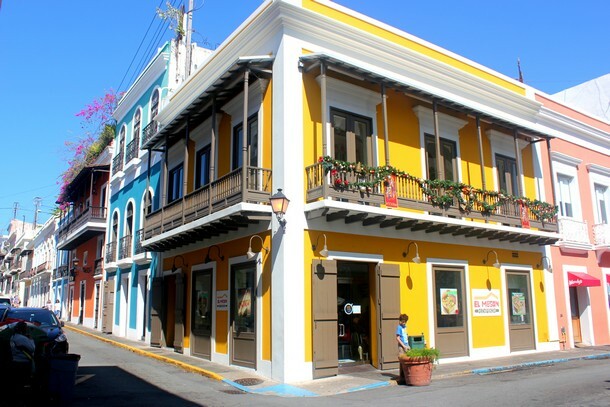 Related – Should you add San Juan to your travel wish list? 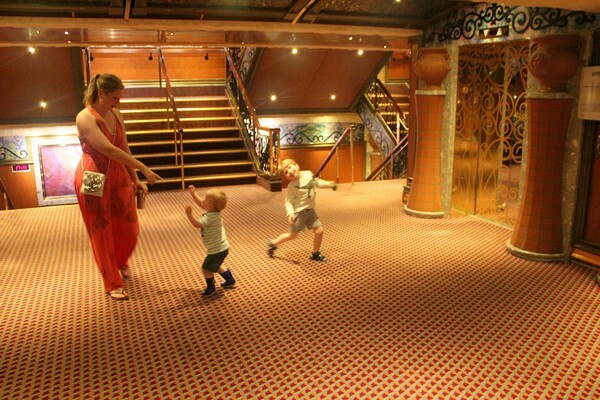 The ship offers plenty of room to dance in the hallways. The main lobby and elevators. Hard to believe this is the inside of a boat! 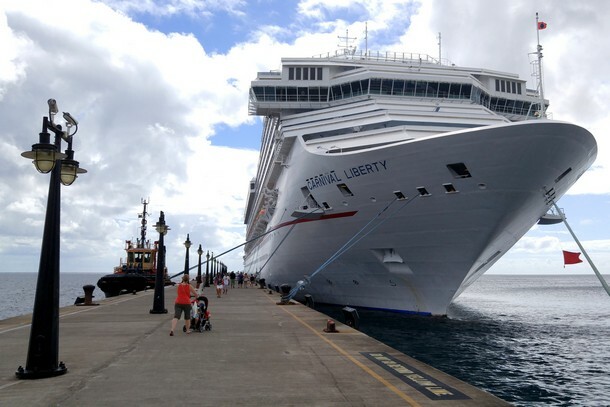 The Carnival Liberty is a 2,974-passenger cruise ship with 13 decks that was launched in 2005 as part of Carnival’s Conquest class. It had a $500 million face-lift in 2011, adding new restaurants, entertainment and shops. The ship consistently gets a 4.5 out of 5 on Cruise Critic and it attracts all types of demographics, from families with small kids (like us) to newlywed couples to seniors. It’s a huge ship that can support a lot of guests without feeling overcrowded. It has several restaurants and buffets on board as well as plenty of entertainment including a casino, 3-story Vegas style theater, live comedy stage, piano bar, night club, sports bar, arcade and games room, and multiple pools and hot tubs. Every night the cruise offers a variety of different live shows, musicians and comedians, so there’s something for everyone. What initially attracted us to the Carnival cruise line is that it caters to all demographics. We didn’t want a crazy party boat and we didn’t want an old folks boat either. We wanted something in the middle. We also didn’t want to do a children-themed boat like Disney because, well, as much as we like the idea of having everything catered to our boys, we didn’t like the idea of being stuck on a boat with 2,000 over-sugared kids on sensory overload. Check out these great deals on Caribbean cruises. The main pool area is at the front of the ship (pictured above) and there’s an adult only pool at the back of the ship. The main pool area has a huge windy water-slide, one main pool and a second smaller pool called Coney Island, and three hot tubs. The pool is filled with salt water, which was a big surprise the first time I jumped in. Keep your eyes and mouth closed! It’s not a very big pool so it got quite full in the afternoon when people returned from their shore excursions. The water is not heated, so it’s quite a shock to the system when you first jump in. It’s refreshing on a hot, sunny day, but we aren’t big fans of the salt water pools. There are three hot tubs on the main pool deck (as well as two on the back of the ship and two more in the Serenity adult only section), but my advice to you is to enter with caution. The hot tubs get quite full (think 10 rugby players squeezed in a warm bath tub) and most people are enjoying several adult beverages – use your imagination. Gross. The main pool and sun deck is where all the action is. There’s live music playing throughout the day and there are two poolside bars, so things get interesting. Because this is the main outdoor entertainment area, you may find it tough to find a row of available sun chairs during peak hours. That said, once you leave the main pool area it’s very easy to find loungers. We spent most of our time on the upper deck at the back of the ship. There are no bad views on a cruise ship! The ship has an adults only relaxation area called Serenity that has two whirlpools and comfy padded lounges. We didn’t spend any time there but it looked like an enjoyable spot to nurse a hangover or work on a new one. In the evenings guests can watch a movie outdoors on the main pool deck. Watching a movie outdoors under the stars while you sail through the Caribbean is certainly a unique movie experience. We watched part of the new Jurassic World movie one evening. Braydon, pictured above, is a dinosaur fanatic and he loves scary movies, so this was perfect for him. Connor on the other hand, not so much. He got freaked out by the giant dinosaurs eating people alive, which is understandable given that he’s only 2 years old. The biggest question we had prior to booking our Caribbean cruise was the layout of the cabin. 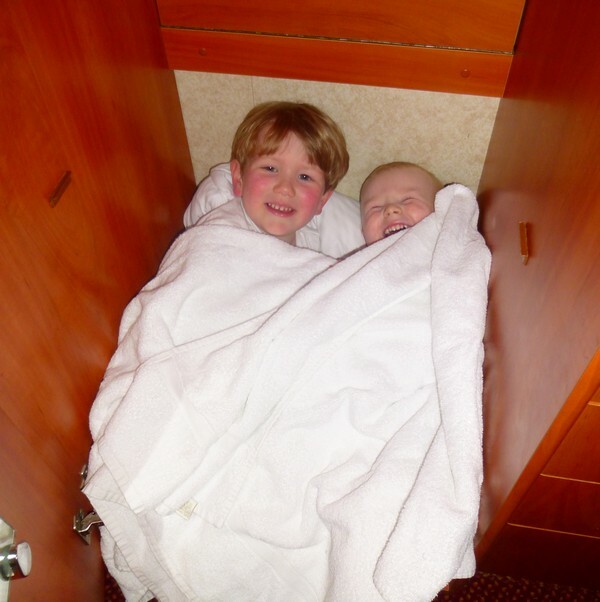 Cruise ship cabins are pretty tight with only two adults in the room, so we had valid concerns about sharing a room with two active boys (plus all the “stuff” that comes with them – stroller, car seats, toys, clothes, diapers, etc). Our balcony cabin was on the 6th floor at the front of the ship. Surprisingly, the room was quite functional. 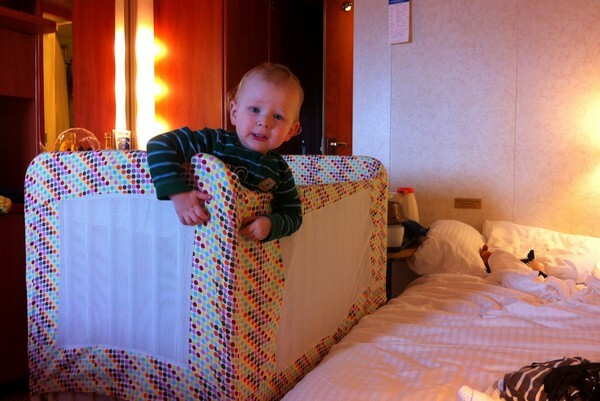 The couch converted into a twin-sized bed for Braydon and we were provided with a sturdy steel crib for Connor. The crib is on wheels, so we moved it around when needed. It was tight, but totally doable. We really liked having our cabin located at the front of the ship. The elevators near our cabin went to floor zero, which is where you disembark for shore excursions. It was also close to the main pool deck. 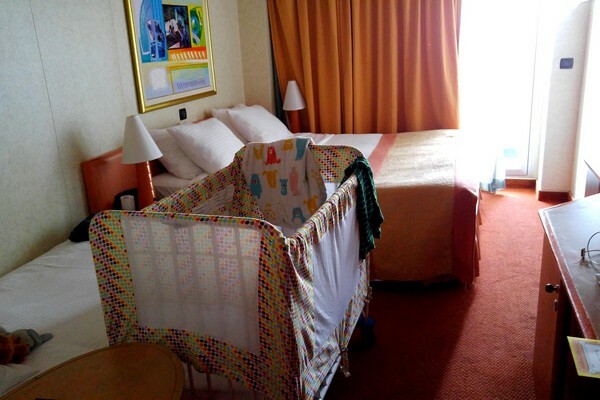 The ship is HUGE so room location does matter, especially with little ones. One of our top baby travel tips is to blast white noise from our ipad to drown out sounds that could wake up our boys. We have two ipads, so we blasted both at high volume at sleep time. It sounded like a hurricane was happening in the room but it allowed everyone to have a good night sleep. There are several different room layouts to choose from, so you have options. This website provides a detailed layout of the cabins on the Carnival Liberty. There are even bunk bed options. Our room had a bed in the ceiling that could be pulled down to give an extra bed. Travel tip: Bring a battery powered flameless candle. It’s a soft light that provides enough light to navigate around the room at night, but not so bright that it will keep you awake. There were only two power outlets in the cabin, so a night light was not ideal because we always had a tablet, camera battery or phone charging. Here’s an example of the flameless candle we have. You can actually see our candle in the photo above, next to Braydon’s feet. The first time we went on a cruise was also with Carnival and, ironically, it was an identical ship. We were super budget conscious back then, so we opted for the lower floors with an interior room because it was the cheapest option. It was fine for the times, but I can’t imagine sharing an inside cabin with no balcony or windows now that we travel as a family. It was so nice to be able to sit on the balcony in the mornings and evenings. When the boys went to sleep, the balcony gave us the opportunity to have a drink outside without disturbing them. Travel tip: If you’re traveling with family or friends, try to book adjacent cabins so you can connect your balconies together. Nicole’s parents’ cabin was right next to us, so we had our attendant open the panel and connect our balconies together. This allowed easy access between our rooms and it gave us plenty of room to hang out on the balcony and watch the world pass us by. An awesome feature was getting complimentary room service every day. For those of you with kids, you know how long it can take to get ready in the morning. Instead of stressing out to get the boys ready for breakfast, we ordered room service the night before and it arrived just as we woke up. Brilliant way to start the day! Every morning we ordered coffee, fresh fruit, pastries, toasted bagels with cream cheese, cereal and juice. It was such a nice way to start the day. And it didn’t cost us anything extra! It’s important to note that alcohol and soft drinks are NOT included. Only food, coffee, water and juice are all-inclusive. If you take a drink from the mini-bar/fridge, you will be charged for it. Because we bring special milk and butter for Connor, we asked our room attendant to remove all of the items from the mini-fridge so that we could use it for other items. This appeared to be a common request, so don’t be shy to ask your attendant to empty the fridge for you. 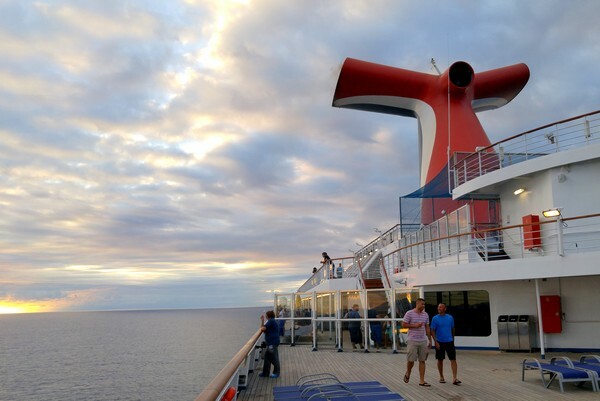 We asked our Facebook followers to share any questions they have about taking a cruise. We’ll address some of these questions as we share our cruise ship experience with you. A big misconception about cruise ship travel is that you’re stuck eating buffet food at every meal. While there’s a buffet open at most hours of the day, there are several other dining options on board the ship. 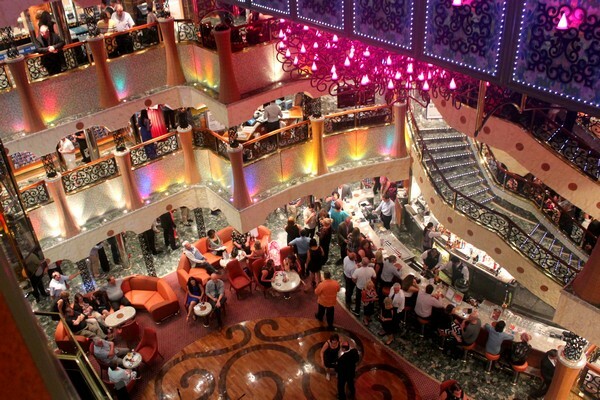 All food on the ship is included, except for the Jardin Cafe (specialty coffee shop) and Harry’s Steakhouse. You don’t need tickets or wrist bands, you just walk up and take whatever you like. The Carnival Liberty has a Guy’s Burger Joint, created by Food Network’s celebrity chef Guy Fieri, that serves up some tasty beef burgers with all of the fixings. It’s nice to be able to walk up to the grill and order whatever you want without having to pay. But use caution – eating delicious bacon cheeseburgers every day is dangerous! Alcohol and soft drinks are NOT included. You pay extra for these beverages. Each guest has a passenger ID card that allows you to charge drinks to the room (kind of like a credit card). You settle the bill with your credit card at the end of the cruise. A detailed description of what you ordered will be provided at the time payment is due. The ship also has Blue Iguana Cantina (fast-food bar with Mexican cuisine – tacos, burritos, etc), Pizzeria del Capitano, fish and chips, and the Carnival Deli that serves handmade deli sandwiches made to your liking. The deli serves dairy free all beef hot dogs, which was a big hit with our boys. I’m pretty sure they had a hot dog every day, but who’s counting? Food options are always a big concern for us. Connor, our youngest boy, has an allergy to dairy and eggs, so we have to be very careful when we travel. The last thing we want is an unexpected visit to the emergency room in a foreign country. Buffets are a great option for kids, especially picky eaters and those with allergies. Not only can you clearly see what food options are available, you can eat when you want. All of the buffets (breakfast, lunch and dinner) serve a variety of fresh fruit and vegetables. The hot food options changed every day and there was always something interesting to eat. When we were not sure what was in the food, we asked. The kitchen staff was very helpful and would check the ingredients for us. We had no food allergy issues on the ship. There are also multiple self serve soft ice cream machines on the ship. Getting a bowl of chocolate vanilla swirl became a daily ritual that Braydon looked forward to each day (okay, maybe a couple times a day). We typically did an ice cream run when Connor was napping, because he can’t have dairy due to his allergy. The dining experience was probably the biggest surprise. We accepted the fact that we would likely spend most of our time eating at the daily buffets. We thought the service at the restaurants would take too long and that the menu options would be identical to the buffet options. Boy were we wrong! The food on the Carnival Liberty was very good. Each evening we would get a new menu of options for appetizers, entrees and desserts. If you’re the indecisive type (or a foodie with a big appetite), you can order multiple appetizers and/or entrees. We indulged in fresh lobster, juicy filet mignon, grilled jumbo prawns, seared ahi tuna, prime rib, seafood linguine, etc. The food came out fast and was served hot – it was much better than the buffet. There are two main dining rooms on the ship. You are assigned to one of the dining rooms and you sit at the same table each night. We dined at the Silver Olympian Restaurant, which is said to be the nicer of the two options, but both were very nice. Because we were a party of six, we were given a private table. If you’re traveling in a smaller group or as couple you may be partnered with other guests. The same people are assigned to the same table each night, so you get to know your table mates quite well by the time the cruise ends. We had a set dining time at 6:00 PM. This was the early seating. You can also choose the late seating at 8:00 PM. Once you choose your seating time, this is the time you’re expected to dine each evening. Our server was fantastic. He was extremely thoughtful and went out of his way to make sure our boys received special off-menu meals. He made sure Connor had dairy and egg free meals and even had special desserts made for him so that he didn’t feel left out. He even gave us an open invitation to stay with his family in the Philippines! You can order wine and beer at your table. Because the price of alcohol is not included, you are required to bring your ID card to purchase booze at your table. The wine list was quite extensive. The low end price was around US$25 per bottle. You can save money by purchasing a block of 5 or 7 bottles of wine from a set menu that has discounted pricing. It’s a good deal if you plan to drink wine each night. Travel tip: Each adult passenger is allowed to bring one bottle of wine on the ship. It’s a good idea to purchase wine prior to boarding. Not only will you save some money, you’ll be glad you have a bottle of wine available in your cabin; especially if you have a room with a balcony. You don’t have to dress up every evening, but you are expected to dress up for the formal Captain’s dinner (black tie). Because we didn’t expect to spend much time in the restaurant, we didn’t pack a lot of formal wear. The boys didn’t even have a collared shirt. It’s recommended to bring at least one nice outfit to wear at dinner. You can have breakfast in the dining room instead of doing the breakfast buffet. This was another great surprise. We mistakenly thought the restaurant was only for dinner. I’ve never been a fan of breakfast buffets. The eggs are typically powered eggs, the bacon and sausages sit in their own fat for hours, the omelette line is always insanely long and the toasters never work properly. On our first morning we did the breakfast buffet and was unimpressed by the long line ups and mediocre food. That evening our dinner host informed us that we can also do breakfast in the restaurant. It was so great to be able to order an a la carte breakfast that is made to order. The ship had plenty of things to keep little ones entertained. Of course, the pool and water slide is the biggest attraction, but there was also a games room and child care services. The games room has lots of video games and carnival-style games like throwing rings, tossing balls to knock over clowns, skee ball and basketball hoops. You don’t need to bring money, you just swipe your card and it will add the charges to your account. You collect points that can then be redeemed for small toys and prizes. Our boys loved the little lizards and must have won a dozen of them. Most games were $1 per game play. The cruise also offered several Dr. Seuss inspired activities, including a Green Eggs and Ham themed breakfast, a Seuss-a-palooza Parade and an interactive story on the theater stage. The Green Eggs and Ham breakfast has a Dr. Seuss themed menu and special guest appearances by the Cat in the Hat and Friends. The staff did a great job converting the restaurant into a Dr. Seuss fantasy land. Braydon, pictured above, ordered pancakes that were red and white and stacked to look like the Cat and the Hat’s hat. He had a great time and still talks about those silly pancakes. Braydon really enjoyed watching and reading the Grinch who Stole Christmas this past holiday season, so he was VERY excited when he scored the ONLY Grinch character in the Seuss-a-palooza Parade. Children and parents collected signs and noise makers at the back of the ship and paraded along the main promenade towards the big theater at the front of the ship. When the parade concluded we sat in the theater and watched an interactive story book reading of Dr. Seuss’ legendary The Cat in the Hat. Participants from the audience acted out many of the scenes with several of the book’s characters. It’s a fun and unique activity that will surely entertain the little ones. Camp Carnival is a children’s club lounge area that offers complimentary kids programs for all ages. They separate kids by age and customize the activities accordingly. Parents are not allowed in Camp Carnival, so your kids must be comfortable playing without you. It’s nice to see that child safety and security is a top priority. Unfortunately, Connor is not good with strangers, so he was not comfortable being left alone. Because of this, we didn’t end up taking advantage of this complimentary service. Here’s more info on the available programs. Each cruise has slightly different processes around getting off the boat. Generally speaking, you get off the boat around 8:00 AM and you’re required to be back on the ship by 4:30 PM. Some cruise ships arrive at port during the day, which will impact the amount of time you have on land. Most cruise lines will state the shore times well in advance so you can pick the best cruise that suits your interests. Getting on and off the ship is an easy process. When you check-in on your first day, you’re given a passenger ID card before you board the ship. This card is very important. You are required to scan the card when you get on and off the boat. We were told to bring a piece of photo ID with us each time we got off the ship, but we were never asked to show it. We only needed the passenger ID card. It has a photo on file so the cruise ship attendant can see that your face matches the card. Each port we visited had a number of shops that were only accessible to cruise ship passengers. Even if you’re not interested in full or half day shore excursions you can get off the boat and walk around on land. Most of these cruise ship terminals have outdoor bars that sell cheap beer and fruity cocktails for half the price you’d pay on the ship. We noticed our Caribbean cruise also offered a 3 or 4 day option from Barbados. On day 3, when we arrived at Barbados, there was a turnover where some guests disembarked, while others began their cruise. They basically did a one way from Barbados to Puerto Rico, with 3 ports along the way. I’m not sure how common this is for other cruise lines, but it seems like a great option for those who want a shorter cruise. You are not allowed to get off the boat to spend the night on land. At least not by choice. The ship has a strict schedule that it must keep, so if you miss the ship’s departure time it will NOT wait for you. If you miss the boat you’ll be required to catch a flight to the next port of call. This would likely be an expense you incur. Don’t miss the boat! Shore excursions can be booked ahead of time or directly on the ship. You can also walk off the boat and find a local tour operator. You can’t miss them – they’re the ones yelling at you once you leave the passenger terminal. Booking excursions ahead of time is the best way to ensure tour availability. You typically pay a little more (when compared to walking off the boat and finding a local operator) but this will ensure you get to do the activities you want. When you return to the ship you are required to pass through security. You and your personal items will need to pass through an x-ray machine. You can purchase alcohol at the ports but you have to check it when you arrive back on the ship. Similar to duty free alcohol on an airplane, the cruise ship staff will hold your items until the end of the cruise. They don’t want you drinking your cheap booze on the boat because they want to sell you booze at top dollar. Getting on and off the ship at the ports was very easy. We typically got off the boat around 9:30 AM and returned around 2:00 PM. We never had to wait in lines. Even though we entered different countries at each port, we were not required to go through immigration or customs. We were never asked for our passports but it’s a good idea to have them with you when you are off the ship. 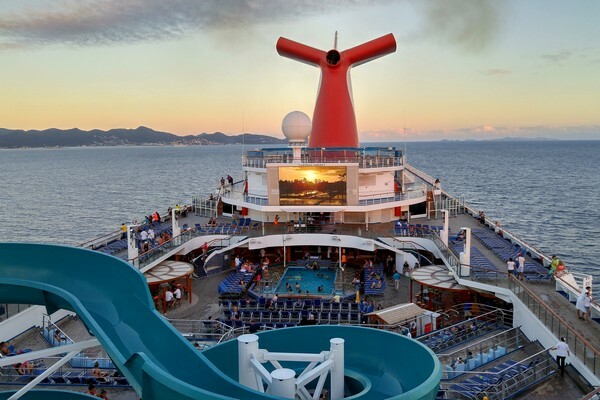 Carnival recommends $12.00 per person, per day. The guidelines allocate $6.10 to dining room services, $3.90 to cabin services and $2 per day for alternative services, which include kitchen, entertainment, guest services and other hotel staff members. This $12.00 gratuity is automatically added to your shipboard account, but it can be adjusted at the guest services desk if you do not feel its fair. Alcohol purchases automatically include a 15 percent gratuity. You are required to show your passenger ID card to make the purchase. You are then required to sign a bill receipt for each transaction. Each bill has a line to enter an additional gratuity, but this is not expected because 15% is already included. In fact, I feel like this extra gratuity line a sneaky way for servers to get some additional gratuity from the uninformed. Tipping a couple dollars for room service at delivery is always appreciated by the service staff. You can also leave some additional cash with your dinner server and your room attendant. Paying our bill at the end of the cruise was easy. We were able to check the accuracy of our bill by logging into our account on the television. You can also use a machine located near guest services. Since everything was charged to the credit card on our room, it was automatically processed and an invoice was left in our room. Around the 5th day was when the automatic gratuities showed up. As mentioned before, this can be adjusted to whatever you like. To adjust the gratuities or any other discrepancies, you need to visit guest relations. It’s best NOT to leave this until the last day. Travel tip: when booking your cruise, look for offers that include an onboard credit. We each received a credit of $140, which made a big difference. The Canadian dollar tanked prior to our cruise, so it was nice to have this extra credit in $US currency. On the final night of the Caribbean cruise we had the option to check our bags for casual disembarkation. Before going to bed we packed our luggage and left it outside our room. We were given tags with a number on it. This number was used to find our bags at the cruise ship terminal. This process lightened our load considerably and made the disembarkation process less congested for everyone. If you have an early flight to catch, you keep your bags with you and get off the ship early in the morning, before the casual passengers. It’s a fairly straight forward process. In the morning, we went to breakfast and then checked out of our room by 8:30 AM. We then relocated to a section on the main promenade and waited for our number to be called. We were number 16, so our number was not called until about 11:00 AM. We expected that by waiting around until 11:00 AM we would have eliminated a lot of the congestion. This was not the case, as the above photo illustrates. We waited in line to get off the boat. We waited in line to get our luggage. We waited in line to clear customs and immigration. Had we known that the lines were unavoidable, we would not have sat around for 2 hours waiting to disembark. It wasn’t the end of the world, but it did take much longer than we expected – so be prepared to wait. If you’re considering a Caribbean Cruise, check out these deals. Share your tips and advice in the comments below. it is very beautiful place to visit and I visited here last month and will visit again after 3 months. Just curious if you book your own travel or use a travel agent? Things like shore excursions can be booked at a better rate through a travel agent. Just a thought for your future travel. Hi, this question isn’t in regards to your blog post but I’m trying to find information and hoping you can help. I have two children less than four years old. We’re traveling to Vancouver and then going on an Alaskan cruise. We’re staying in Vancouver for three days and I’m thinking of not bringing our car seats. It’s just too cumbersome. Do you know if I can rely on public transportation (buses, taxis, translink, etc) to get around the Vancouver area? Hi Lucy – it depends on how long you are in Vancouver and what you plan to do. We bring our car seat with us, but I totally understand that the car seats will occupy a lot of prime space in the small cabin. You can get taxis that have car seats, but it’s not an easy task and most taxis aren’t thrilled about putting in the car seats. The train from YVR into the city is fine, you don’t need a car seat for that. Buses are also fine. Where will you be staying in Vancouver? How much time to you plan to be in Vancouver? Hi! Thanks for replying back! We’re staying three days in Vancouver until our cruise. We’ll be in staying in the Riley Park area. We have two boys and so I’m thinking it’ll be a treat for them to ride the trains and buses. Yea, we have two big car seats (Britax and Graco). How old are your kids and what car seats do you use to travel? We like them, but they are quite heavy. Our boys are 4.5 and 2.5 years old. You can take the train from the airport to either the Oakridge-41st station or King Edward station. Buses don’t need a car seat and you can catch a bus on Cambie St that takes you into the city. Transit is pretty good in the city. Wow!! unbelievable. This Caribbean Cruise always blows my mind. I wanted to make it a try sometimes. By the way, thank you for the tips. Please keep up the good work. Nice! Ive done two south pacific cruises with Jake and they are great. When I eventually come back to North America I think a Caribbean cruise will be in order. Glad you enjoyed this cruise on Carnival. I recently did a Disney one earlier this year and thought it was subpar. Interesting! We want to try a Disney cruise at some point. What did you not enjoy? 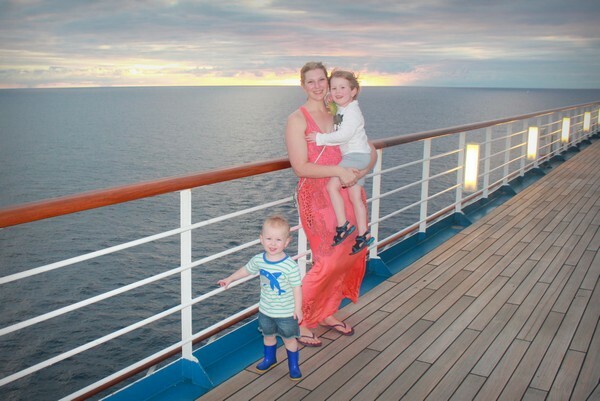 Cruises are a great choice for family travel! Thanks for sharing your review. Thanks for all your tips! I would love to know where you got the crib cover! Everytime we have cruised we just get the standard white crib but I love your polka dot shell! The crib came like that, we normally just get a normal white crib too. It must be the type that Carnival gives.